Here along the Space Coast we have trails, miles and miles of trails. Singletrack, and jeep trails through wilderness, dikes along vast wetlands both fresh and saltwater. Some of our trails systems have designated backcountry campsites for a true wilderness bike / camping experience. For the less off road inclined cyclists we have greenways an bike paths that still allow you to enjoy native habitats and the birds and wildlife that the Space Coast has to offer. On the locations links above the trails are divided into two catagories, Wilderness or MTB Trails, and Greenways or paved trails, and are further subdivided based on their location within the Space Coast. 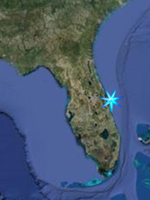 Starting at the north end of our coverage area, Space Coast North, You can MTB nearly all proprties managed by the St. Johns River Water Management Area, including Buck Lake, Salt Lake, Canaveral Marshes, and Seminole Ranch Conservation Areas. 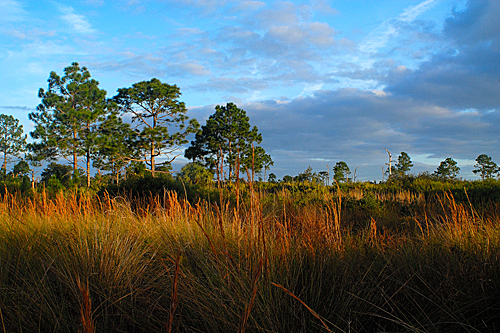 Another preserve, the Hal Scott Regional Reserve and Park is in joint ownership with the District and Seminole County. These trails are located within the vast array of Conserved lands along the St. John's River Floodplain and contain a variety of habitats including wooded uplands, scrublands as well as wooded marshes and swamp. Of these areas, Buck Lake, Seminole Ranch, and Hal Scott contain designated backcountry campsites that you can bike to. There are additional recreation lands that offer wilderness or mountain biking, and these include Lake Proctor, Black Hammock, Chuluota, and the Geneva Wilderness Areas managed by Seminole County just west of Brevard's Space Coast. These offer singletrack trails and some doubletrack or old jeep trails where an incredible diversity of habitats and wildlife can be observed. Two more properties, managed by the State are Tosohatchee Wildlife Management Area in Orange County and the Little Big Econ State Forest managed by the State. Another biking opportunity exists at the Orlando Wetlands Park where you can bike among many miles of raised dike roads that encircle the impondments and recreated wetlands used to treat Orlando's Wastewater. The wetlands are managed to attract a spectacular array of birds and wildlife. Finally, great but mostly overlooked biking exists at the Merritt Island National Wildlife Refuge (MINWR) just east of Titusville. While MINWR does not have any official biking trails and the 7 designated hiking trails are hiking only, the miles and miles of Dike Roads that surround the vast mosquito control salt marsh impoundments are open to Hiking and Biking and suitable for Mountain Bikes. From these trails you can observe literally hundreds of herons, egrets, ducks, pelicans, spoonbills, osprey, and many other species while also viewing alligators, otters, bobcats, and a whole varity of wildlife. Many of the dike roads are also open to vehicular traffic as well, but the ones barracaded off to vehicles are still open to Bikes and Foot Traffic unless there is a sign specifically telling you no access. Pack a fishing rod and a few lures and you are also set for fishing for our world class redfish and seatrout as well. For those who enjoy leisurly biking along paved trails in the North Area we have the Titusville Area Wellfields Trail, a two mile paved multiuse trail preserved upland woodlands of the scrub habitat of the ancient Atlantic Coastal Ridge. The Area around the wellfields trail is also home the gopher tortoise, indigo snakes, bobcat, raptors, songbirds, turkey, gray fox, and many other species. The City of Titusville's Chain of lakes Park Trail takes you around the parks stormwater lake as well as to an observation tower that overlooks the park and the Indian River Lagoon. Restored and managed wetlands along the trail offer a variety of wildlife observation opportunities. Fox Lake Park in Titusville offers a bikeway roadway around the park and offers views of fox lake and a chance to see everything from Sandhill Cranes, Limpkins, and many other species of birds as well as alligators in the lake. Rounding out the selection of paved trails in and around Titusville is the trail at Sand Point Park as it winds through this Indian River Lagoon front Park in Titusville next to the Titusville Municipal Marina. While the Central Portion of the Space Coast has a higher density development pattern, it still offers several biking opportunities, both off road and paved. The Mocassin Island Trail can be found within the River Lakes Conservation Area, managed by the St John's River Water Management District and offers about a total of four miles of wilderness riding through the St. Johns River Floodplain as well as an observation tower, while on Merritt Island, the Ulumay Sanctuary offers about 7 miles of Dike Road (unpaved) offering views of the vast mangrove habitats of the Sykes Creek Headwaters. For Paved Rides, yoiu can try the Walk the Rock Trail, an urban 4.5 mile paved bikeway around a section of the city of Rockledge, which can be accessed by bike from the 74 acre Community Park of Rockledge where a 30 ascre preserve and a paved walkway / bikeway winds through the park and offers a wetlands overlook. Melbourne's Wickham Park offers paved riding among the many ammenities of the park including several ponds, campgrounds, and access to several miles of hiking trails. Intracoastal Park on Merritt Island is a 8 acre park that offers meandering trails along the Banana River, while on the beachside, you can ride the Port Canaveral Multiuse Trail, which extends from the campground at Jetty Park past the many attractions of the Port to the Locks at Ports End. Down in Satellite Beach, you can ride the A1A Bikepath which takes you along the beachside of A1A and provides access to several oceanfront parks. Among those are Hightower Beach Park, roughly 18 acres of prisine beach and dune habitat protecting roughly 1/2 mile of coastline with an observation platform and about 560 feet of boardwalk so visitors can view the habitat and scan the native vegetation for migratory songbirds and other species that reside there. In addition are the chances to see examples of Sabellariid Worm Domes, which are colonies of Sabellariid Worms attached to the flatter coquina rock ridges. Another park, Gemini Beach Park, has no auto parking being reserved for Bike riders and pedestrians only. On the Mainland in Malabar, trails with names like the Ho Chi Min Trail, the Blue Loop and Root Canal provide some challenging single track MTB rides within the vicinity of the Turkey Creek Sanctuary while the Boundary Canal Trail a paved greenways project, provides connection to additional MTB trails within the Cameron 100 acres. 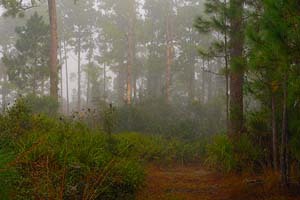 Three EELs properties, the Jordan Scrub Sanctuary, the Malabar Scrub Sanctuary, and the Micco Scrub Sanctuary provide a combined 28 miles of singletrack and doubletrack MTB trails through native Florida habitats. Paved Options include the Boundary Canal Trail and the Sandhill Trail while the proposed South Brevard Linear Trail will offer further options. On the Beachside, Sebastian Inlet State Park has a network of trails, both MTB and paved which begin at the Sebastian Marina for beachside riders.